LegYoYo - High Quality Handmade Yo-Yo Holsters! LegYoYo Holsters are one of the latest projects from the community that we are really excited to carry here at YoYoExpert! This is the Epsilon Holster! The Epsilon holster was created by a member of the YoYoExpert Forums who initially made a few for himself out of necessity. LegYoYo (YoYoExpert Forum Name) always had a yo-yo at his side wherever he went, but he found the standard yo-yo holders and holsters would wear out and break way too often. One day he started playing around with some hand made holster designs, and what he came up with was really good! So good that people started asking him to make more! 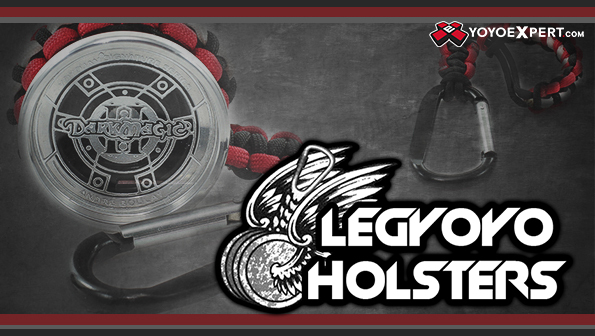 Each LegYoYo Holster is crafted by hand from 550 paracord and a sturdy carabiner. They are 100% custom designs that are built for form and function and utilize 2-3 different colors to give you a really cool custom look! There are two styles for the Epsilon Holster - Slip and Slide - Both are really easy to operate with one hand and feel very secure when in use!